For goodness’s sake. It’s just not. 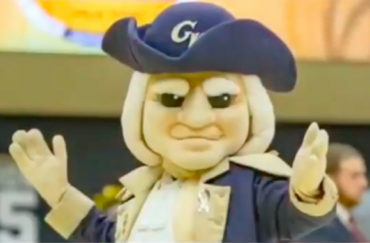 “Students at George Washington University have voted to urge the removal of the Colonials name from the university’s athletic teams,” reports Inside Higher Ed. Ho-hum. “Students demand mascot name change” is one of the more common headlines of our day; all of these little dust-ups are very silly, though some more so than others; one of the best was Cal State Long Beach’s retiring of its “Prospector Pete” mascot because it allegedly represented “violent and genocidal acts” committed during the Gold Rush. Let’s just get this out of the way: No, a “Colonial” mascot is not “received as extremely offensive” by very many people at all. Probably 99.2 percent of people who encounter the mascot don’t think twice about it; like most other minute details one encounters throughout daily life, it constitutes little more than background noise—just a logo and an image on some university merch. Vanishingly few people actually think about it more than that. As for the idea that the mascot “glorifies the act of systemic oppression:” Of course it does not. The idea that we cannot separate a the idea of a colonial from the worst actions of some colonials is little more than a fallacy. If historical wrongs were so inextricable from the broader people and populations that committed them, then very few historically named institutions could survive this hysterical purge. The school in question, after all, is called “George Washington University;” Washington, lest we forget, was a willing and perpetual owner of slaves and profiteer of slave labor, and could only bring himself to totally free his slaves posthumously. George Washington was, of course, more—much more—than his (admittedly catastrophic) moral failings. We are capable of recognizing that; we should thus be capable of recognizing that a “Colonial” mascot is similarly, in the main, inoffensive and acceptable. Schools shouldn’t give into this type of student hysteria; it will only encourage more. And if nothing else, renaming your school mascot “the Hippos” is a fast ticket to becoming a national laughingstock.